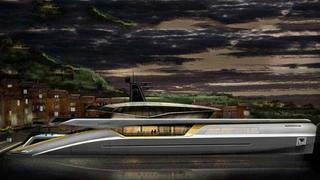 Design Unlimited have announced that they are to unveil the design for a 50m motor yacht at the September 2013 Monaco Yacht Show. The concept is being developed in cooperation with custom superyacht builder Pendennis and will be revealed to mark its 25th anniversary celebrations. Specialising in both interior and exterior yacht design, Design Unlimited have placed a specific focus on the integration of these two spaces in order to create a visually striking motor yacht. The use of floor-to-ceiling windows in the main saloon and the geodesic skylounge glazing allows for the flow of natural light as well as creating an elegant and modern finish. This concept aims to give the owner maximum space for relaxation and socialising. It allows for a choice of design according to clients’ needs with either the main pool on the aft deck with a view down to the beach deck and bar, or alternatively the sunpads and spa pool on the upper deck above the wheelhouse. Other features include a gym and fitness area on the lower deck and a generously sized garage to store tenders, dinghies and other water sports equipment. The 50m yacht will fall within the 500GT threshold and accommodate up to 12 guests and 10 to 12 crewmembers, however, a 75m version of similar style is also under development that will allow for more space and a greater variety of amenities.